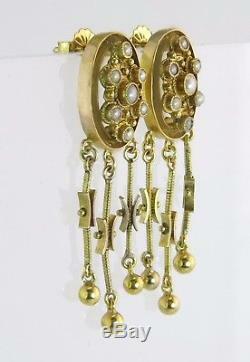 Featured for sale here is a genuine pair of antique pearl 18K gold dangle earrings! 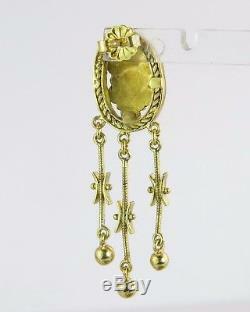 This pair of earrings is a showcase for great design and craftsmanship! Piece is crafted from gold that highlights the gorgeous display of fourteen genuine pearls! Pearls vary in size with two 2 mm and twelve 1.5 mm. All are bezel set in the yellow gold for a lovely contrast! Ornate design with fine milgrain work and engravings decorating the gold! 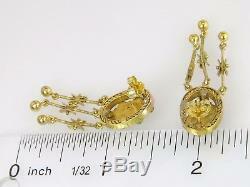 Six balls dangle from gold extensions 25 mm off the earrings! This piece is truly a treasure that is in great condition for its age! Made from solid 18K yellow gold; no hallmark adorns this piece. Pin has locking latch for safe and secure fit! Beautifully crafted detail is the perfect mix of history and beauty! A must have for your jewelry collection! Thank you for shopping with us! The approximate retail price we state is not an appraisal; we do not provide appraisal prices on the items we sell. You are the only person who can determine the worth of the piece. 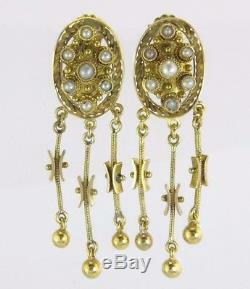 The item "Antique Estate 18k Yellow Gold Genuine Pearl Victorian Dangle Earrings 6.4g" is in sale since Saturday, December 2, 2017. 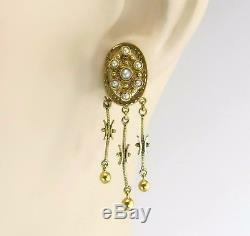 This item is in the category "Jewelry & Watches\Vintage & Antique Jewelry\Fine\Victorian, Edwardian 1837-1910\Earrings".trading" and is located in Dearborn, Michigan.